On Instagram recently, I've been teasing my new FOOLPROOF homemade salsa recipe (given to me by my friend Tiff, who is now a household hero). It's not only out-of-this-WORLD, good (Bubba says it's better than restaurant salsa, which is saying a lot…) but it's embarrassingly easy. All you need is a blender! 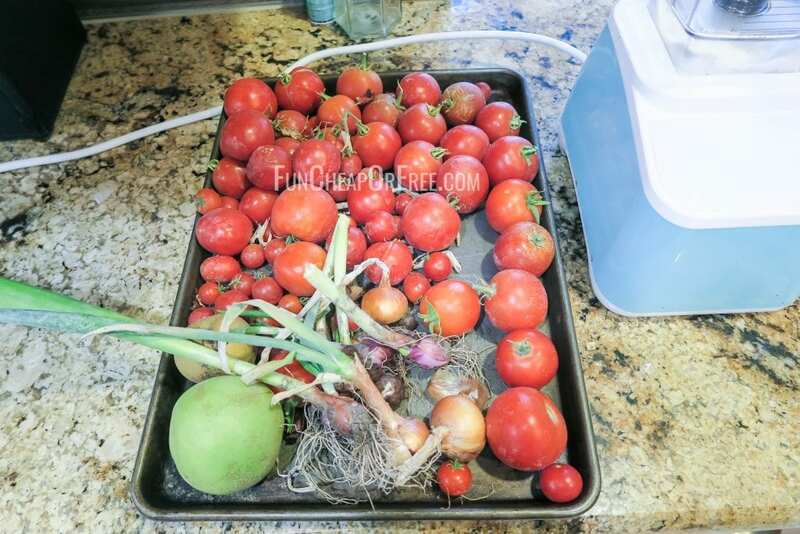 The original recipe is made from canned tomatoes, but I have been using my abundance of garden tomatoes instead and it's just as easy and delicious. I have really come to appreciate my garden this year. I've pretty much only gotten an abundance of tomatoes, lettuce, and bell peppers, but even that has been incredible! A great way to eat fresh food and save money at the same time. Either way, whether you use canned tomatoes or fresh, the ability to whip up a batch of quick salsa without going to the store is the epitome of what glorious Shelf Cooking is all about! Optional: add 1 teaspoon red pepper flakes. It doesn't make it too spicy, just adds a little spice and some deeper flavor. 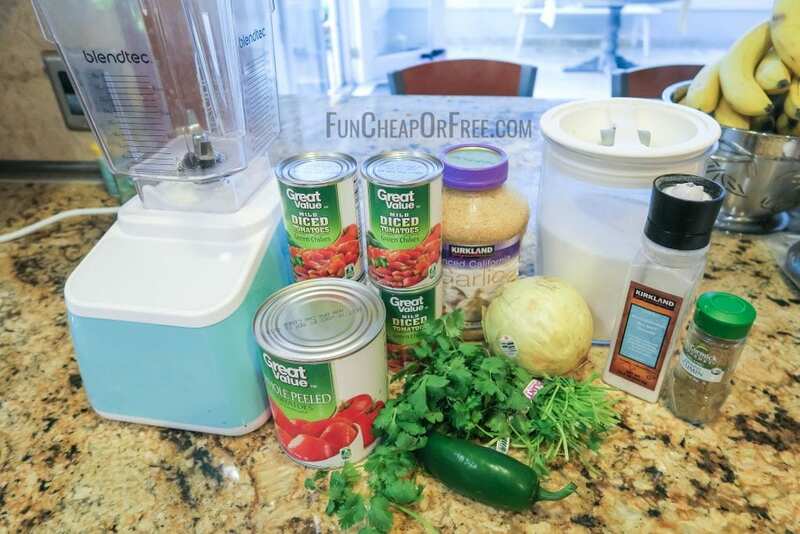 Pulse ingredients in a blender or food processor until you get the consistency you prefer. First, I gather all the tomatoes from my garden and fridge that need to be used up. …and gather all the other ingredients. Pulse ingredients in a blender or food processor until you get the consistency and chunkiness that you'd like. We ate what we could, but before it goes bad I divided it into mason jars to freeze to for a later date. Note – If you freeze them in jars opt for the wide-neck jars, or give plenty of space in the narrow neck jars or they WILL break! TIP: Again, when freezing, be sure to leave enough space in jar or container to allow for expansion. Hope you enjoy this easy-peasy recipe as much as wen do. Again, get the FREE recipe printable HERE…and enjoy! If you roast all your fresh ingridients before blending it adds an amazing depth of flavor. To make it even easier, use four small or two large cans of tomatoes, and one can of HOT Rotel. Then you don’t have to mess with a jalapeño! I make salsa this way all the time- it’s delicious! Yes! Bags or jars, tupperware too. All works great! Isn’t this The Pioneer Women’s recipe? Not sure! My friend Tiffany gave it to me. I have been proud to be apart of the freebs nation before but today…. today I made your super simple, super amazing salsa and all I can say is #gamechanger I went back to store and froze a second batch. Thanks so much for sharing!!! Sounds easy & delicious. What size can of tomatoes do you use? I was really skeptical about the salsa recipe because of so many canned items but oh my goodness it’s delicious! It tastes right out of the restaurant. I wish we could get Rotel here in Australia, I can’t even think of a substitute. I’d love to meet my own salsa, we go through a lot in our family. I just use diced tomatoes! I rarely use rotel. I just add some extra seasonings and jalapeño for spice. What is the freezer life span? We LOVE this! I want more budget, healthy and vegetarian friendly recipes! Do you find that when you defrost the salsa it separates? Mine does and not sure why? Thanks! Someone else asked but I don’t see an answer… how long will it freeze for? It’s delicious!!! HI! I tried this in my Vitamix; it doesn’t have a pulse feature. I ended up making, what looked like, V8. Do you have any tips on how to keep the consistancy chunkyish? You need a food processor then, or something that can quickly hand-chop! or just blend it for a quick second or two. But every blender should have a pulse feature, check your manual! I’ve been trying to find the perfect salsa recipe so Im excited to try this recipe out! Um yum! Will be making this! This salsa all day everyday!! Yum! I made this the other day and loved it! Very tasty and ready to make all year round. Thank you! I need to try this, I love me some salsa! Thanks for the recipe can’t wait to try it! I love homemade recipes! I’ve been trying really hard to make food at home and we’ve been saving so much money! Best salsa ever! It is soooo easy and sooo yummy!! Thank you for a new go to recipe! This was a hit! Added a couple extra jalapenos because I’m always looking for more spice. I’m really wanting to grow my own garden this summer and make this haha. This was really yummy and SO easy to make! It was the perfect snack and we already had everything on hand. Win, win, win! Best salsa ever!! No lie! We make this way more than I would like to admit because we pretty much just drink it at our house. Thanks for sharing Jordan! Yummy!! I’m seriously addicted to salsa so I can’t wait to make this! I love salsa!! Can’t wait to try it! I have so many tomatoes from my garden at the moment, this looks like a yummy, and easy way to use up a bunch! This post made me crave this salsa all over again! So, so good! Best salsa ever!! I’ve made it 3 times in the last month and gifted some of it to family and neighbors who all love it too. I have some in my fridge right now! So yummy!! Love easy salsa! I can’t wait to try this. Seriously the best salsa! 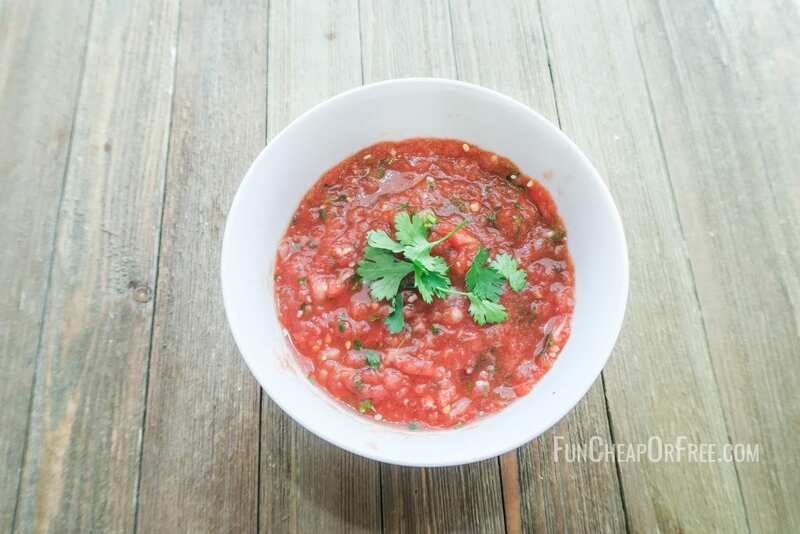 Tastes just like the salsa served at our favorite Mexican restaurant and so easy to make! Thanks for sharing! I used this when i had short notice for company coming and needed snacks. What a lifesaver. Everyone loved it! It made its way into my recipe binder. I made this recipe and gave some away for Valentine’s Day and it was so delicious!! We are obsessed with this salsa!! My mouth is watering over this salsa… It’s 11:30 at night and if I had all of these ingredients right now I’d be making it!! Tomorrow will have to do! Easy, delicious, and addicting! Thanks! I’m a salsa fanatic to say the least! I’ll try the recipe for sure and let you know what I think! I also love that it’s made for lazy me and being so simple! Winner; every time! 🙌🏼 Thank you!!! Oh my gosh! I can’t wait to try this. Chips& salsa is my favorite part at a restaurant! I love that this uses cab ingredients so I can make it in the winter! I makes this salsa all the time now! I love how simple and easy it is!! I’ve heard you talk about your salsa for along time, I’m so glad you shared the recipe! We’re a chips and salsa family over here, looking forward to making this, it sounds very easy!!!! Can’t wait to try. Love home made salsa. 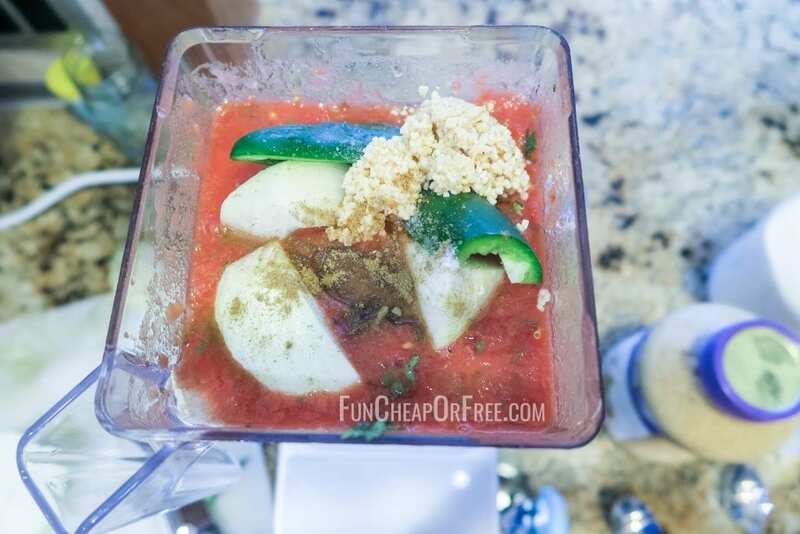 MY HUSBAND LOVESSS THIS SALSA RECIPE!!!! Salsa is my kids JAM! I’ve mastered some simple salsa recipes but I think I am going to try this one. I never thought of using a can of Rotel for the extra flavor! Also maybe I’ll try it with the fire roasted tomatoes by Great Value. I don’t think you can get them in the large cans but hey anything for a good salsa recipe!!! I’ve made this 4 or 5 times now. So easy and delicious!! This recipe sounds amazing! I’m going to have to try it!! I always see your kiddos enjoying it in tge IG stories so it must be delicous!! I’m definitely making this salsa today!!! 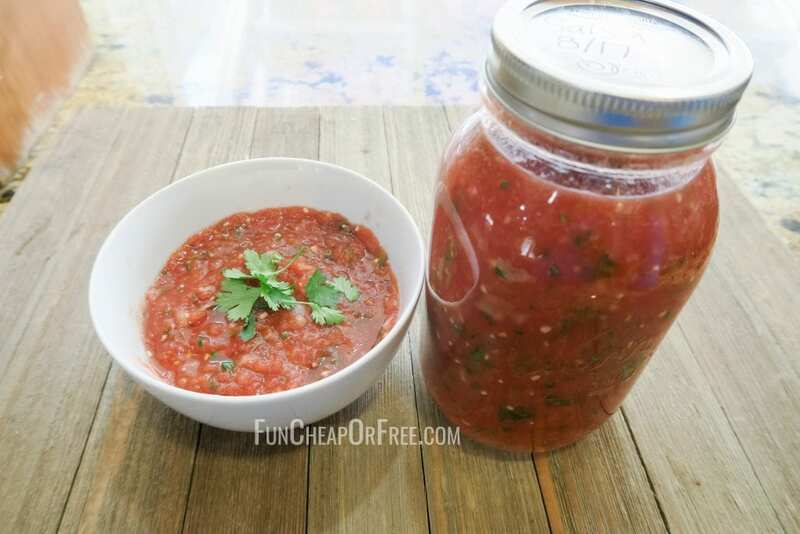 I absolutely love salsa, and this looks like a simple way to do it at home. Thank you! My husband gets so excited for dinner any time I pull out this salad! I found this same recipe on pinterest 3 Year’s ago and have been using it all the time ever since. It’s the best! 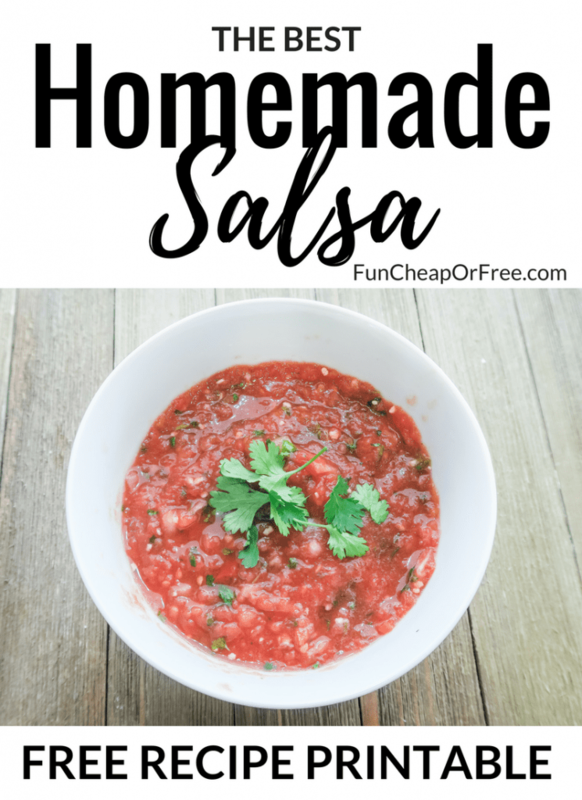 I wish I would’ve known you had thidnon your blog last week when I made the worst batch of salsa ever and embarrassingly brought it to a gathering hoping no one would notice haha this sounds great and super easy!!!!! Thanks for the recipe! Made it and the whole family loved it!! Every time I try to make salsa I hate it. I’m excited to give this a try! Thanks! I love a good salsa recipe! I can’t wait to try this one! This is such a great recipe! I just made it for a get together with my family and everyone loved it! I love salsa, I can’t wait to try this recipe! Thank you! I’ve been dying for an easy salsa recipe! So glad I found this, will definitely be trying it out. This looks so yummy! I need to make this! I LOVE salsa! Im kind of a snob because I love “fresh” salsa not store bought. Thanks for the awesome recipe! Yum!!! I’m going to try this ASAP! Looks really similar to Puoneer Woman’s recipe that I ❤️❤️❤️. Chips and salsa are my favorite snack ever! This salsa is the BEST! My hubs is a salsa conasauer and he loves it! Looks amazing! Never thought how easy it was to make! Definitely saved the recipe. We are going to try it this week! We love salsa!!! This sounds and looks soooo good! I tired this salsa 2 days ago. And it was a hit!! My husbands very picky when it comes to salsa and he loved it!! Next time I will add the seeds and pepper flakes to make it extra spicy for him. Thanks so much for all the awesome tips and tricks you share. I’ve made this recipe three times since finding it a few weeks ago and I love it! I love that it makes so much I always have a jar to give away. Yum! The lime juice… crucial! I’ve made your salsa! And hubby asked what I did different it’s his new fave! So so so excited to try it!!! 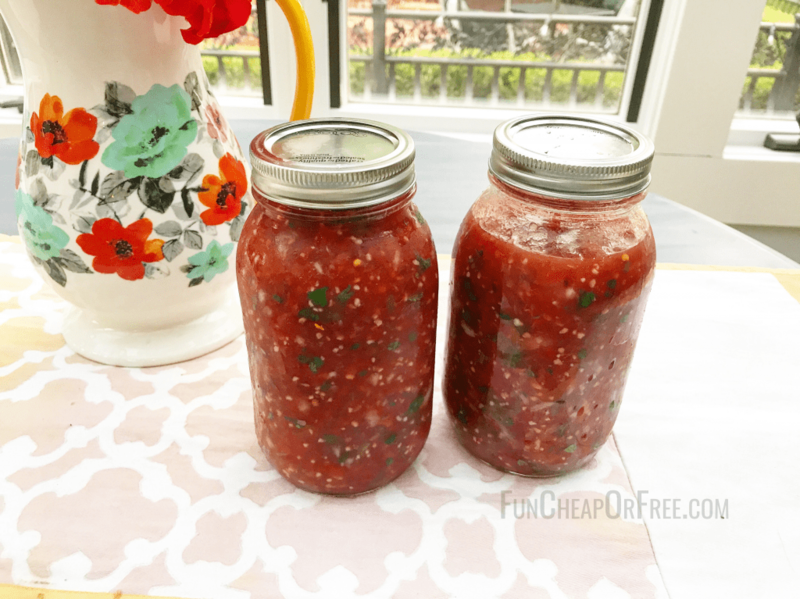 Ive made this salsa so much and it has saved me so much on chili’s salsa! YAY! I’ve probably come to this page about 20 times when I’m at the store for ingredients, making it, printing it out for a friend. It’s the best! I love salsa especially when it is made at home!! My husband and I love salsa, I will have to try making this recipe. I’m obsessed with this salsa. I make it all the time and my family loves it too. I LOVE SALSA…. all kinds of salsa. I’m printing and making tomorrow!!! i 💜 this salsa recipe! This is my favourite. So easy and very yummy – can’t wait to try it! Hi Jordan, I’m from the UK. What size can of tomatoes is that? our standard size cans are 400g which is about 14oz US so no idea how much tomatoes to add and I love me some salsa! Oh my Gosh, this was amazing! Had a plethora of tomatoes from our garden that we’re gonna go bad. Super easy, filled two Mason jars I had. One for us and one as a gift for a friend, “just because” who loves salsa, Tuesday. Thank you for sharing!